On Wednesday 7 June, RGCL welcomed Javier Pérez-Guerra from the University of Vigo in Spain. 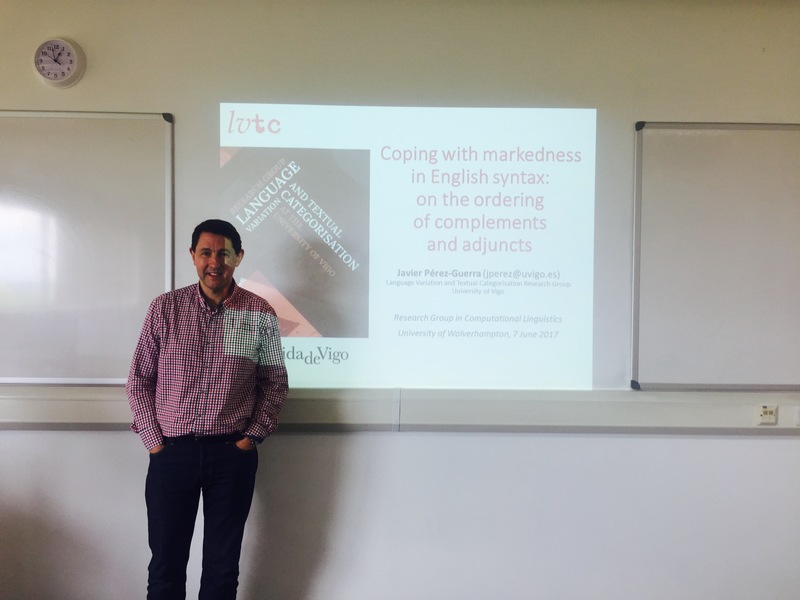 Javier is currently a Visiting Researcher at Linguistics and English Language Department, Lancaster University and we were very pleased that he could spare the time to visit and to give a talk to our Research Group. The talk was well attended and very well received! This talk examines the forces that trigger two word-order designs in English: (i) object-verb sentences (*?The teacher the student hit) and (ii) adjunct-complement vs. complement-adjunct constructions (He taught yesterday Maths vs He taught Maths yesterday). The study focuses both on the diachronic tendencies observed in the data in Middle English, Early Modern and Late Modern English, and on their synchronic design in Present-Day English. The approach is corpus-based (or even corpus-driven) and the data, representing different periods and text types, are taken from a number of corpora (the Penn-Helsinki Parsed Corpus of Middle English, the Penn-Helsinki Parsed Corpus of Early Modern English, the Penn Parsed Corpus of Modern British English and the British National Corpus, among others). The aim of this talk is to look at the consequences that the placement of major constituents (eg. complements) has for the parsing of phrases in which they occur. I examine whether the data are in keeping with determinants of word order like complements-first (complement plus adjunct) and end-weight in the periods under investigation. Some statistical analyses will help determine the explanatory power of such determinants. This entry was posted in Seminars, Seminars 2017 on June 8, 2017 by riilp.